Former adult actress Maria Ozawa caused quite a stir during her visit here - and the Google Trends report shows! Over the past couple of days, searches for 'Maria Ozawa' on the search engine experienced a pretty huge spike after news broke on Sunday that the 31-year-old actress was in Malaysia for a holiday. And get this: two states from the East Coast topped the list for most searches. 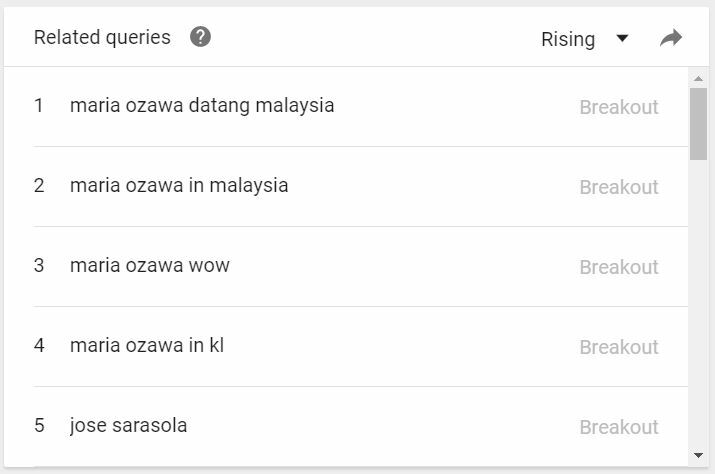 According to the data from Google Trends, Kelantan had the highest number of searches for Ozawa, followed very closely by Terengganu. Labuan was third in the list while Perlis and Pahang rounded up the top five. In contrast, people in Penang, Selangor and Putrajaya did not really care about Ozawa's visit as they have the least number of searches. We wonder why that is. Among the top search queries include "maria ozawa datang malaysia", "maria ozawa wow" and - get this! - "siapakah maria ozawa". Several films that she starred in - namely Tokyo Species, Nilalang and Erotibot - also made the list. Ozawa was recently in town with her boyfriend, Filipino actor and chef Jose Sarasola, for a quick getaway before reportedly flying back on Wednesday.